American violist Jacob Clewell stands in the vanguard of musicians of his generation. 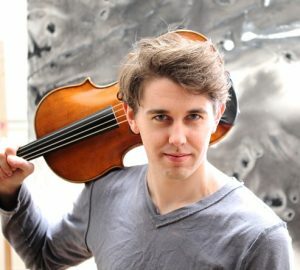 Gold Medalist of the 2017 Vancouver International Music Competition, his recent performances include Mozart’s Viola Quintet in C major and Chausson’s Piano Quartet with Vera Beths and Pedja Muzijevic at Le Domaine Forget in Quebec, Vasks’ and Dohnanyi piano quartets with the Velox Quartett at the Scotia Festival of Music in Halifax, and recital appearances in Canada, England, and the United States. He also plays in the internationally acclaimed Ezra Duo with pianist Sasha Bult-Ito. He has served as principal violist of the Royal Conservatory Orchestra under maestros Gabor Takacs-Nagy and Bramwell Tovey, and at the Marrowstone and Eastern Music Festivals under maestro Gerard Schwarz. As a member of The Glenn Gould School’s New Music Ensemble he has performed works with featured solos by Eliot Carter and Julian Anderson, and appeared in Toronto’s contemporary music festival, 21C. Born in Raleigh, North Carolina in 1992, Jacob spent the majority of his childhood in Oklahoma, playing viola in school and local orchestras. He holds diplomas from the Cornish College of the Arts, Stony Brook University, and The Glenn Gould School, where he studied with Mara Gearman, Nicholas Cords, Lawrence Dutton, and Steven Dann. He has undertaken additional study in Europe with Yuko Inoue and Roger Chase.